Chris (Westie): I want to move on from wearing M&S/Next shirts that don’t fit me properly. Would my next step be to go straight to a tailor? How much can I expect to spend and do I need to know what kind of material and colour or pattern I want? Going straight to a tailor is always going to be the preferred option if you can find one that is easily accessible and not too expensive. I couldn’t afford the majority of tailor-made shirts in London. The cheapest I have found are at SuitSupply for individual shirts (around £80) and at Brooks Brothers for bulk orders (around £70). Both are too expensive for me to use as my regular shirt suppliers. I was fortunate enough to go to Hong Kong a few times on business, and having now had my measurements taken by a reliable tailor there, and had them adjusted a few times, I have a reliable source of new shirts that fit well and cost around £25, which is much more reasonable. This is the option to go for if you can find a comparable service – but I’m aware that may not be possible. There are options to have shirts made to measure over the internet. Manning & Manning over at www.shirts-custom.com is one example. However, I have never tried any of these services and so cannot vouch for them. What’s more, I wouldn’t trust myself to measure myself. Something is bound to be altered in the very act of measuring, rather like quantum mechanics. And getting someone else to do it might be even worse. Better to have a proper tailor involved. So, Chris, your next best option is to spend a lot of time trying on shirts in slightly more upmarket shops. This will take a while but is worth it. Think about the experience as all the shopping you’ll ever have to do, rolled into one weekend. Massimo Dutti – Some of the best shirts for value for money. Two lines around either £40 or £60. There are more tailored options, as well. Rather too short in the tails, but that is inevitable these days as manufacturers want to save money by using less material, and men often want to wear their shirts untucked and therefore do not want dress-length tails. Reiss – Some nice shirts but a very slim fit. Many fit me well around the waist but are too tight across the chest. Collars also a little too large for my taste. Also rather expensive – usually £60 to £80. You might as well order a bunch of made-to-measure shirts for that price. 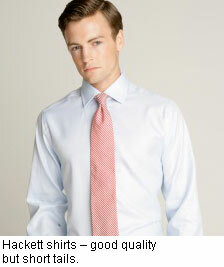 Hackett – Probably my favourite off-the-peg shirts that I still own. Good quality. Could be a little narrower in the waist but not bad considering. Also a little short in the tails. £50 to £70. TM Lewin – Again, good value. In the sales often reduced to £25. And there’s always a sale. Good long tails but far too large in the waist for me. They now have a semi-fitted line but I haven’t tried them. £25 to £50. I hope this is useful, Chris. Another option would be to go to a department store and try on a lot of different brands. Stand in front of three mirrors, to show you every angle. And bring a girlfriend with you, or a man with at least as much interest in clothes as you. Looking at the folds across your back will be key (see my posts on the fit of a suit). You can follow the discussion on Reader question: Upgrading shirts by entering your email address in the box below. You will then receive an email every time a new comment is added. These will also contain a link to a page where you can stop the alerts, and remove all of your related data from the site. I will have a look at those shops you suggested. It is interesting how difficult it actually is to find a shirt that really fits one well. Personally, I’ve found the best slim fitting shirts for me come from Express and Gap (in that order of slimness), but I am very slim and it sounded as if Chris was shearching for nicer shirts than that. And thank you Simon for directly answering reader’s questions. No problem Chris. And remember, it’s worth all the searching around different brands and shapes. As soon as you find the one for you, you never have to try on a shirt ever again. Have you tried Tailorbyrd shirts? If you can find a brand that fits at the neck and across the chest, don’t forget that there is a tailoring option open. A good tailor will take in the side seams and adjust the sleeve length for you. A good point, EAEL, and one certainly worth considering if you want to retain the more luxurious fabric of high-end labels. Tailors fabrics can be a little unreliable at the best of times. Super 300s anyone? I’m surprised that none of the other Jermyn Street names get onto your list. I buy from Charles Tyrwhitt a lot and consider them to have a better cut than TM Lewin but at a similar price. The tails are a little shorter but there are fewer pleats at the cuffs which I prefer. Thomas Pink is a more expensive but higher quality option too, and there are smaller brands like Hawes and Curtis which make some great shirts. I wholeheartedly agree with you about spending some time in shops trying on each manufacturers shirts for sizing (walking the length of Jermyn Street on a Saturday should do it). I know my size in each brand and mostly now buy online through their respective websites as sales come and go and when I need something in particular. Many of these makes now have a slim fit range, though of course whether this works or not for you is a personal thing. In my experience, William, most of these Jermyn Street names that have now expanded across London to appeal to the City market – TM Lewin, Hawes & Curtis, Charles Tyrwhitt, Roderick Charles – are much of a muchness. They all offer decent quality shirts but without a great fit. Given the constant sales at TM Lewin, where you can always get a shirt for £25, they are the best value. I agree that they are pretty similar in many ways. Charles Tyrwhitt have joined the permanent sale ranks which is why I have a preference for them (given my comments on cut and fit vs. Lewin) – £25 shirts are now always available from them. Why do you suggest going to a tailor, when it is a shirtmaker who makes shirt? A tailor makes suits. GMludlow: You are pedantic. But worth knowing the difference. I can’t the difference between the CT and Hawes shirts. Your advice on finding out your size in each store is a brilliant idea. Could you possibly cover Harvie and Hudson of Jermyn St’s shirts? Their off the peg shirts seem to be of very high quality but could you tell me more? The best cheaper shirts are Tywhitt or Pink (sales) . The trouble with Charles Tywhitt is they have maybe only two or three styles in collars but some of the material is good. Pink are much better than Hackett, Lewin or Reiss. Check out the top line Marks and Spencers shirts (forget the rest of their shirt production ) . That said you can have a shirt made to measure in Milan for 30 pounds.